Some people are terrified to speak in public or in front of a group. These simple can help you do better at it, even if you don’t like it. Here’s how to speak in public to a group. It is always easier to speak about something you know. For example, it would be easier for me to speak about baseball, a game I have played and watched since childhood, than to speak about cricket, which I have only seen played a few times. You want to capture and hold the attention of the group as you speak. This will be easier to do if you know something about the audience. What are their interests? What questions might they want answered? How technical are they? Find out as much as you can and tailor your speech to the audience. 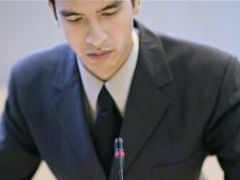 Depending on the speech, you may write out the entire text of the speech or you may just down some notes on cards. Review what you write down and make sure it flows in a logical way. Fix it if it doesn’t. You have prepared for this speech so there is no need to be worried. You know the material and you know your audience. Now just go out and deliver a polished, rehearsed speech. A smile on your face will make your audience respond more positively to you. It will also help you feel better. Obviously, if you are delivering a speech to your department that they are all getting laid off you don’t want to smile, but in almost every case it will help you. If you use a joke to open your speech, make sure it’s a good one. It should be funny without offending anyone. It helps to keep it as closely related to the topic as possible. And it should be new. You are speaking about a subject you know. You are prepared. You are relaxed and smiling. Use this speech as a way to share with your audience your enthusiasm and it will be a fine speech. Posted in Work Management by vimonmass on September 15, 2014 .